1. transplant tomatoes, cucumbers, greens, squash, pumpkins, melons, peppers, eggplant, beans, basil, dill, cilantro, sweet corn, more cabbage and broccoli, more lettuce…..
6. harvest and eat early lettuce, spinach, asparagus, scallions, parsley, radish, kale and other greens…. 9. do something nice for your mom…. …A gardener’s To Do list for the month of May is waaaay too long to complete here, and we know you’re busy, so we’ll try to keep it short this week! Vegetable starts are the hot item this year – in addition to nearly 80 varieties of heirloom and hybrids tomatoes, we are now sending out flat after flat of peppers, cucumbers, summer and winter squash, and eggplant – as well more lettuce, greens, broccoli, cabbage, cauliflower and early season veggies. Watch your local garden center for fresh shipments this weekend! And keep in mind, when transplanting out these warmer season plants, watch the forecast carefully because nighttime temperatures can still drop low enough to nip or stunt plants like tomatoes, peppers, and squash. Have some clear plastic, row covers (like Remay), or even old tarps or bedsheets to throw over tender seedlings at night if frosty temperatures threaten. Unless you’re using something really light, place stakes or hoops around the plants to hold the weight of your row cover so it doesn’t crush the small plants. In case you’ve been in a media vacuum and missed the other thousand reminders out there, remember that Sunday is Mother’s Day. For plant-loving moms in Lane County, this weekend offers a great selection of garden-related events. Take your mom (stepmom, mother-in-law, grandma, kids) and spend a few hours walking around Eugene browsing for terrific ornamental and vegetable plants – it will help work off that big Mother’s Day brunch! 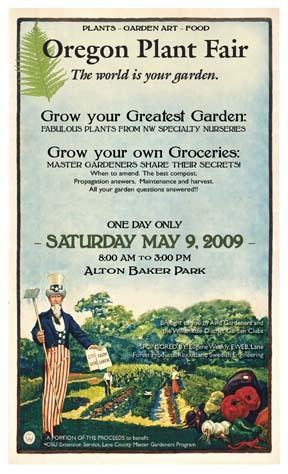 Presented by Avid Gardeners and the Willamette District Garden Clubs and featuring specialty nurseries and artists from around the Northwest. Part of the proceeds go to support the OSU Extension Service Lane County Master Gardener Program. The volunteer organization dedicated to helping people learn about and love plants puts on “a sale by gardeners for gardeners,” with over 30 vendors offering a range of plants and garden art. Over 160 local farmers and growers offer Oregon-grown vegetables, fruits, herbs, cheese and other foods as well as fresh flowers and plant starts for your garden. You can read previous issues of Garden News in the Log House Library.